I originally wanted to do 31 Days of Thrills and Chills in October. Hahahaha. I'm so out of practice. No but seriously, horror is one of my favorite genres and you can really indulge in October because it's expected. I'm hoping I can still crank out a few of the posts I wanted to, but I figure I better start! Lately these days, I mostly listen to audiobooks because I can do that while I'm working. Audio is still a bit tricky for me, though, I am still looking for stuff that will keep my attention. And I really wanted scary books for October. 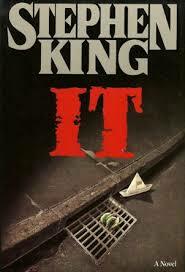 Did you know this was my first Stephen King? Well technically my second--I listened to another short audio novella, but this was the first real experience I think. And I randomly chose It because I thought it was more of a horror story and really all I knew about it was that there was a scary clown and the idea of a scary clown being the premise just seemed absurd to me, so. Oh my gosh I had no idea what I was getting into. Halfway through I decided to look up stuff and discovered this book is considered a sort of turning point for his work, it's one of his longest, etc etc. It was mostly good, a few really awful things that might have had thematic significance but I wish weren't in there, and a ridiculous ending as I have come to expect from seeing movies, lol. And at times, I was bored. It, in case you don't know, is about a small town in Maine that by all accounts has nothing really going for it and harbors a dark mysterious evil force that terrorizes and eats children basically. It shows up to them as the thing they fear most and it's really scary! Basically, though, a long time ago, a group of friends (all boys and one girl!) thought they defeated this evil monster, but made a vow to come back if it ever resurfaced. They then forgot everything about their friendship and childhood and they all moved away until the force reawakens and the only one who stayed behind calls them all back. So the story kind of takes you back to their childhood while also telling you what's going on in their present lives and it's loooong. Pretty much everything about the girl's storyline is terrible and cringeworthy. There is a hate crime that opens the book that is awful and lots of bullying throughout. Anyway! There are quick brief, overdue thoughts about IT. Have you guys read it or seen the movie? Apparently a new movie is in the works. I hope they cut out all the stuff about Beverly. They probably will since if they include everything it will be two days long.